Let the celebration begin. 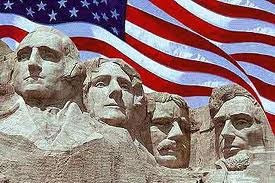 The celebration of the collective birthdays of the great presidents in the history of the U.S.
Washington and Lincoln are the key presidents we celebrate. But there are so many more who get forgotten. I discovered on site that was conducting survey of the most underrated president. An interesting approach to the holiday. They stated that George Washington, Thomas Jefferson, Abraham Lincoln, Theodore Roosevelt, Woodrow Wilson, Franklin Roosevelt, Dwight Eisenhower, John Kennedy and Ronald Reagan were off limits. I'm torn between Lyndon Johnson because of his social engineering and civil rights policies and John Adams for his work (albeit while vice president) in developing the rules of the senate and helping Washington get the nation off to a good start. In terms of the most overrated president, if there were a category for that, I would choose John Kennedy. It is an interesting question to ponder this weekend. If you feel like it, let me know your thoughts.